Struggling with Lower League Management in FM18? We have a few tips for you. This guide is based on English Lower League Management, this isn't how you should play the game, but tips and advice of aspects of the game you may not use. 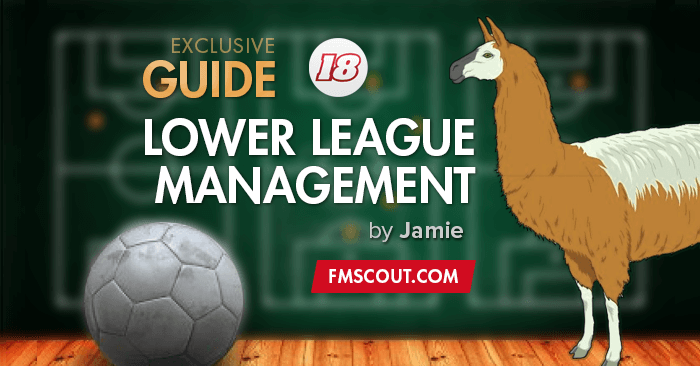 Hello all welcome to my Lower League Management guide, we will be covering every element of becoming a successful lower league manager and taking your club up the leagues and I will be giving you some of the tips I've found since playing Lower League Management. So you may be wondering who I am as I've never written a guide, my names Jamie and Im a streamer for FMScout, I've been playing Football Manager/Championship manager since you could sign Wayne Rooney on a free transfer from Everton, I can never remember which year it was. Since I started streaming with FMScout on Football Manager 2015, that's when I started to get into lower league management, we took Whitehawk to Champions League glory in FM15, we then took Waterloo Grammar School Old Boys to the Championship who were a division 12 club on Football Manager 2016, we took FC United & Whitehawk to the Premier League in Football Manager 17 and were currently doing a Blyth Spartans save on Football Manager 2018, all of these saves have been live streamed. Over these 4 years I've learned something new every year and believe it's time to share my knowledge, now people who watch the streams will obviously know what I'm probably going to speak about as some of them watch me daily, others I believe I have some good advice and tips for you. 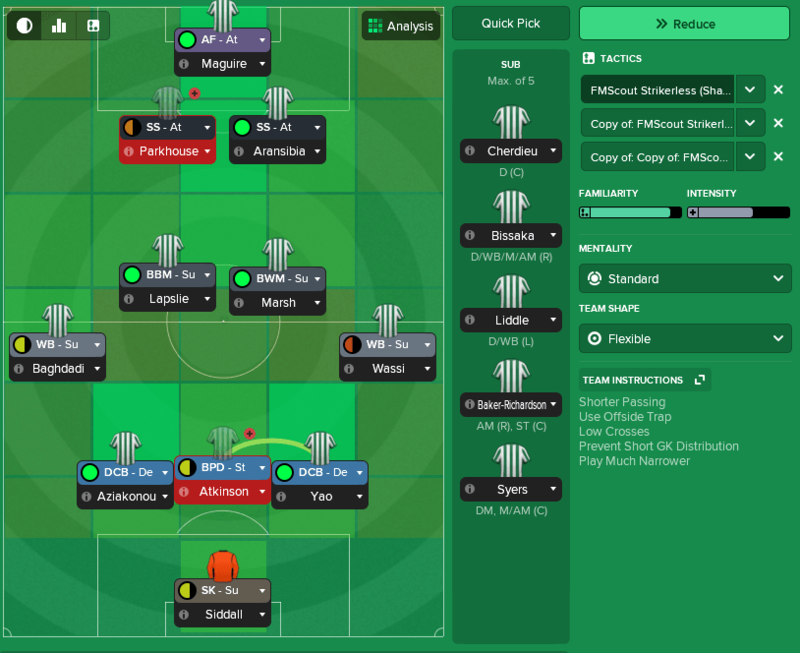 The first thing you should do before processing the first day is look through the whole team and find the formation and roles that's right for them, there is so many variations of roles/tactics in today's game it's impossible for me to tell you what tactic is best so I'll give you a generic overview. Keep it simple, especially with player instructions and team instructions, always watch the first friendlies on "extended highlights" to get a feel for the team, once you've selected the roles and formation, this way you can see if something is going wrong. Is your winger constantly shooting when cutting in? Then add a "shoot less often" into his player instruction. Again I'm not going to sit here and tell you exactly what player instructions to use because most players have traits which could go against the player instructions. Try and avoid team instructions which ask too much from this level of the player, example, "Pass into Space" but why? Unless your players have extremely good passing, lots of passes will go to the opposition resulting in a possibly counter attack leading to a goal. Another one I dont tend to use is "be more expressive" this requires a very talented team, something that you don't get in the lower leagues. 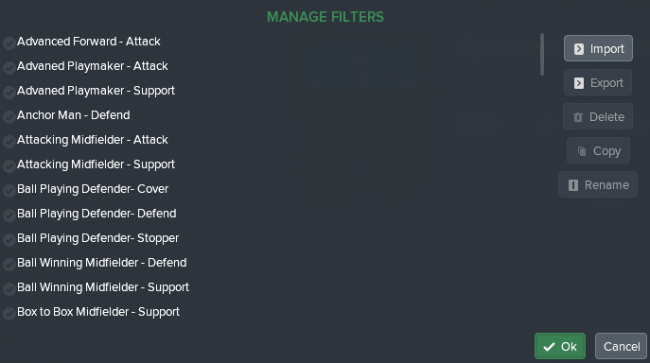 My current Blyth Spartan save I'm using Narrow, Shorter Passing, Prevent Short GK Distribution and use offside trap which avoids anything over the capabilities of my players, again keep it simple. Once I've selected my tactic i will then put 3 tactics into all 3 slots. This means the players will learn the tactic much quicker, this should always be done whenever changing any tactics around, if you 3 different tactics throughout a season this isn't possible. It helps the team understand the tactic more, if you do this one day you will probably have full familiarity by the 1st game of the season. 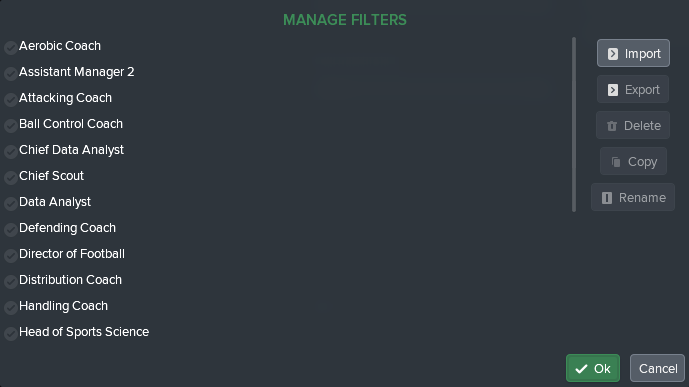 A few years ago i uploaded a video on YouTube, a guide how to make money in the lower leagues by playing certain games and generating TV revenue, this no longer works so the only good thing about friendlies right now is to play against weaker teams, this will raise the morale before the start of the season. I always choose the "smaller" teams options and avoid high reputation teams, if you want a challenge then try it, there is no benefit in choosing a higher reputation team though, complacency is a problem if choosing "low reputation teams" I always have around 6 friendlies in pre season, usually enough to help with the fitness and get the players used to my tactics. Team reports is a tactic i live by, if i didn't use these then i probably wouldn't of been so successful as a lower league manager, I did a little demonstration on them in a stream and some of the viewers couldn't believe what they was seeing and going forward will start generating the team reports. So what are team reports I hear you ask? Your scouts will do a full team report on the club you choose, he will scan the first team, under 23s and under 18s in which a report will generate of the available loan players. 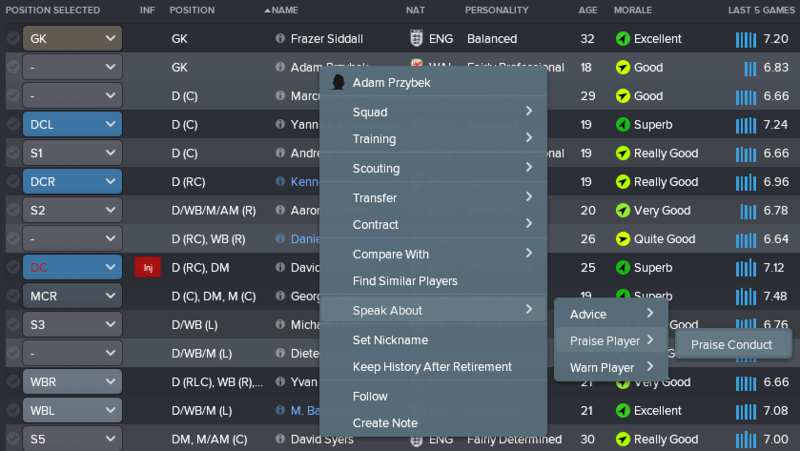 If you are starting in the lower league, chances are you probably only have 1 scout so try and bring in as many as possible before generating the team reports, why? 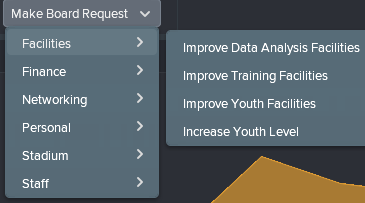 Because the more scouts you have the quicker the team reports come to your scouting centre; 1 scout to team reports every league club will probably take around 3 week, 4 scouts to generate the Premier League will take around 4 days. I hear some of you asking, why not just use the loan list on the transfer market? While you can i have a good example from FM17, I remember scouting Bristol City when i was Whitehawk in the National South and a player called Dowling was valued at £1.2k on a big loan list in the scouting centre, It turned out this player was a 5 star for the National South and his current ability was able to play in League Two, what a signing! I would of never gone that far down to look for a player in the loan list. Listen to the star ratings, this will be in the next section below. Many of you will be wondering how i find most of my players, luckily i stream the game which means it's live and everyone can see how i play in pre season and how i find my players, I've created custom filters to help me find the right players. These filters are a god send in finding the right players. You can find the players by looking for attributes of players that a good for each and every role. While you may not find the player you're looking for it's a good way to find players by attribute. I also use my director of football probably more than most people I've seen, it's quite underrated and I've had instances where he's found a gem of a player. I would 100% suggest using your director more. I noticed many people say "ignore the stars" when I'm live streaming, It's never let me down in the lower leagues. The assistant manager is more than likely going to be clued up on the players you're looking for. The star rating is based on the team you currently have, so if you bring in a 5 star loan signing, the chances are other players in that team who are lower may drop to a lower star. I'm proud to say, in the lower leagues star rating is what i go for. Another little trick for loan signings I do is go to the loan market, look for players who are interested in a loan, filter them by the value so the highest is at the top and bring in around 5 players on 1 month loans on the very first day, why? Because you may have 8 short term loans in the lower leagues, bringing in these high valued players for 1 month will increase your chances of finding better loan term reports via the team reports at the above, It must increase your rep slightly enabling you to bring these players in. Now staff in the lower league is important, but it's more of a quality over quantity situation, you need to be extremely careful over the bank balance and in the lower leagues you are barely generating enough money to get by. Just employ the important staff members, a general all rounder coach, a fitness coach is a must. Again i use my filters to find the best staff possible. You don't need 5 coaches, because lets be honest in the lower leagues the amount of players coming in and out your club when you're going through the leagues is much higher than if you was in the premier league, the potential of the players you have is probably very low so keep staff to a minimum. This one is extremely important in succeeding as a lower league club, if you have a players that are high valued i would suggest cashing in and making profit. If you can keep him and believe he can perform in the league above by all means try and tie him down for another year. If he wants to leave, let him. Squad Dynamics come into play this season and a player who's making other players unhappy shouldn't be at the club, the team overall will not perform on the pitch resulting in losses and bad run of forms. Many people who watch me know if I find a great player in the conference, chances are he will be sold by the end of the season if he's wanted by bigger clubs who are willing to play the money. Now this doesn't mean sell players for 10k, it means anything over 100k while even in the Conference, you should sell. This will enable you to have a good bank balance and massively helps in the wage budget the following season as you've made money making your financial fair play much better. Don't give players what they ask for, always try and negotiate the contracts. Try and remove any yearly wage rises or release clauses if possible, chances are if he's put a release clause in he's quite ambitious and believes he can probably player at a higher level. These can be counter acted by "season landmark goals" "international appearance fees" and such. Yes it takes longer and it's much easier just to press "suggest terms" but in the long run, it will help. Always ask for a senior affiliate. Chance is you will probably get one and they will start to look for suitable clubs. When you get the list, it's all about selecting the right club and selecting the team with the best training/youth facilities but this is more when you reach the football league, when I'm in the conference I tend just to choose the team that will give me the most income, I use the team reports to find my loans, therefore wouldn't necessarily need loans from them. Now the lower league fixture congestion can get a little crazy, sometimes you can play matches within two days. The thing that many people don't know is that the AI doesn't rotate and will always play the strongest squad, even in the Premier League, did you know that? Next time you have two games extremely close and so does the other club, look at the fitness of the opposition players. They will probably be starting their best players at around 80-85% while when you've rotated your players they might be around 95% giving you a huge advantage and a great chance to get a victory. By all means if your rotation players aren't very good then play your best player. I rotate my teams quite a lot in the lower league as fitness is a huge thing, a great fitness coach along with rotation I live by. Now, we all enjoy a cup run right? Wrong, some people see it as extra games and they want to concentrate on the league, usually what i say when i get knocked out even though i wanted to progress. Now this wouldn't usually be in this guide, until one person said in my stream he purposely gets knocked out of the cups in the lower leagues of England because he just wants to focus on the leagues. While that's understandable, if you manage to get an extremely good draw in the FA Cup and reach the Third Round and get Manchester United away, your bank balance will receive around 1 million in the bank from gate receipts of that game. Even being a league two/league one team you should be always aiming to find that club in the FA Cup, now i know it's complete luck but if it happens, the money is rolling in. I also see people who never upgrade their facilities, if you sell a player for a good sum of money in the lower leagues, ask the board to upgrade the facilities. If you feel your in a good position to do so, definately consider it. Once i sell a player i always tend to upgrade one of the facilities, the last thing you need is getting to the Premier League with poor training facilites and poor youth facilities and then having to spend big, chances are you'll be needing the spend that money on the players and not the facilities. Another little trick which people have noticed me doing is raising the morale by right clicking the player and praising their conduct, this always works and I've never had a player actually speak badly about this option. If you result in using this, don't praise the players last game if he played bad, he will react and his morale will probably go down, praising the conduct always seems to work and a great way to keep the players happy! 5 comments have been posted so far. what do you think about individual training in lower league ? Does the praise conduct still work? AMAZING GUIDE, THANK YOU I'M A PROPER FAN BOY.